For links to member groups of the London Mining Network, see the About page. Mines and Communities is an international network of communities impacted by mining companies, and organisations supporting those communities. Its main work is the hosting of the Mines and Communities (MAC) website, which contains a vast amount of information about the damaging activities of hundreds of mining companies around the world and the strategies which communities are using to resist destructive mining projects. The four British member groups of MAC – Down to Earth, Partizans, PIPLinks and the Society of St Columban – are also members of London Mining Network. Who’s funding what in mining? Need to know which banks and institutions are funding which mining companies – and where? From Money to Metal is an indispensable, frequently updated database with helpful analysis. The non-profit Business & Human Rights Resource Centre runs a free online portal to bring together and demystify lawsuits from across the world alleging human rights abuses by companies. The portal summarises cases in non-legal language, giving the positions of each side. It also presents special commentaries by experts. Cases profiled include London-listed mining company BHP Billiton, sued in Australia and Papua New Guinea over pollution by its mine in Papua New Guinea. Coal Action Network (CAN) is a network member group, and a grassroots campaigning organisation. CAN works to end open-cast coal mining and burning coal for electricity in the UK. 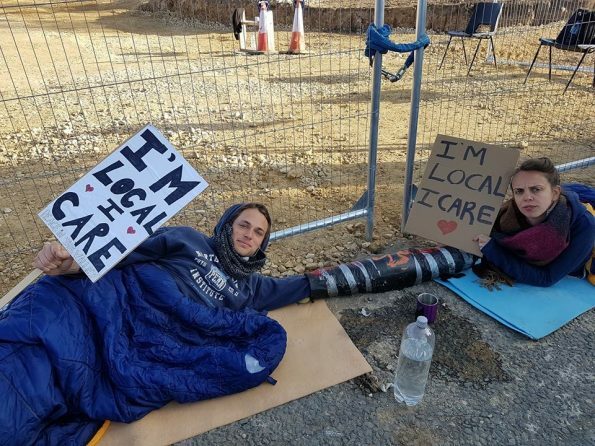 They do this by working in solidarity with communities affected by open-cast coal mining and pollution, both in the UK and internationally towards a just end to coal now. Dark Materials: the consequences of clinging to coal: a report for the Mines and Communities network. CoalSwarm is a useful website for information on coal: an on-line collaborative information clearinghouse on U.S. and international coal mines, plants, companies, politics, impacts, and alternatives. End Coal provides a resource for local communities, activists, students and researchers who would like to learn more about why coal is not the solution to the world’s energy needs and how we can work to stop the expansion of coal and promote better alternatives for meeting energy needs. No Opencast Coal is the website of the Loose Anti-Opencast Network (LAON) in the UK, providing news about anti-opencast struggles and UK government policy on coal. This website shows you two possible futures. The first, fossil-fuelled future is the one we’re heading for if we carry on down our current energy path. This is the future that current government policies and business practices will take us to, according to mainstream energy experts. This is a future of runaway climate change and widespread human suffering. In the second, cleaner and fairer future, we show you how it is possible to provide everyone on the planet with a high quality lifestyle, with access to education, medical care, efficient transport, comfortable homes, and entertainment, all powered by existing clean energy technologies. It also includes a Two Energy Futures briefing. Amnesty runs a Business and Human Rights campaign. It believes that all companies have a responsibility to respect human rights in their operations. It believes that the business community also has a wider responsibility – moral and legal – to use its influence to promote respect for human rights. It aims to change law and regulations to ensure that companies are accountable for the human rights impacts of their operations. BankTrack is a global network of civil society organisations and individuals tracking the operations of the private financial sector (commercial banks, investors, insurance companies, pension funds) and its effect on people and the planet. BHP Billiton Watch is an informal network of communities and organisations across the world who are concerned about the impacts of the world’s largest diversified resources company (active in mining, oil and gas). Archive: their website hasn’t been updated for a few years. Carnival of Dirt is an alliance of community groups and others (including London Mining Network and Occupy LSX) working to expose the destructive impacts of mining and oil around the world, beginning with a ‘funeral procession’ in London on 15 June 2012 to commemorate those who have been killed for their opposition to mining and oil projects. CAFOD (Catholic Agency for Overseas Development) works to better understand the positive and negative impacts of the private sector on development, with a particular focus on extractive industries, transparency, tackling corruption, human rights due diligence and the implementation of the UN’s business and human rights guiding principles. Corporations are one of the most potent forces dictating and circumscribing how our lives are lived and undermining the survival of the world’s ecosystems. Ways of effectively challenging their power and fighting for real democracy are being constricted. This project, run by LMN member group Corporate Watch, aims to explore the ways in which corporations exercise power over the decisions made in what we call a democracy, and the ways in which their ideologies and discourses facilitate this by co-opting and/or suppressing people’s active democratic participation. The Counter Olympics Network questions the way in which the Olympic Games operate, their impacts on local communities and the commercialisation of athletics, including the role of corporate sponsorship by companies such as Rio Tinto and BP. The Environmental Investigation Agency (EIA) is a London-based international campaigning organisation committed to investigating and exposing environmental crime. EJOLT is a large collaborative project bringing science and society together to catalogue ecological conflicts and work towards confronting environmental injustice. The Environmental Justice Organisations, Liabilities and Trade project is an FP7 project supported by the European Commission that will run from 2011-2015. The project supports the work of Environmental Justice Organisations, uniting scientists, activist organisations, think-tanks, policy-makers from the fields of environmental law, environmental health, political ecology and ecological economics. For blogs, resources and maps on environmental conflicts see: http://www.ejolt.org/. In March 2014 EJOLT launched an interactive atlas of resource conflicts which it intends to update continuously. The aim of the European Network for Indigenous Australian Rights (ENIAR) is to promote awareness on indigenous issues and to provide information for Indigenous Australians about Europe and international organisations. Website mostly in Spanish, but with English language articles as well, on the impacts of the Cerrejon mine in the province of La Guajira in Colombia, and community resistance to it. The Cerrejon mine is owned by London-listed mining companies Anglo American, BHP Billiton and Glencore. This website is ‘the voice of La Guajira’ and is run with the help of CENSAT Agua Viva (Friends of the Earth Colombia). Foil Vedanta is an indpendent group of activists challenging the activities of Vedanta and its subsidiaries. The role of mining companies in Indonesian-controlled West Papua is one of the issues of greatest concern for those working for Papuan independence. FoE’s corporates campaign aims to challenge the power of huge corporations, among them mining companies. Representing workers in mining, energy and manufacturing at the global level. Friends of the Earth Netherlands (Milieudefensie) is a non-governmental (NGO) environmental organisation with more than 90,000 members and supporters and eighty local groups, conducting campaigns on climate change, globalisation, traffic, agriculture and conservation of the countryside. Occupy London Stock Exchange, famous for its camp outside St Paul’s Cathedral in the City of London, is critical of the enormous inequalities generated by the current financial system. Occupy organise talks and activities to draw attention to the negative impacts of companies listed on the London Stock Exchange and other aspects of the global economy. Phulbari Resistance is an initiative of BanglaPraxis in solidarity with the communities resisting a proposed open pit coal mine in Phulbari, Bangladesh. Asia Energy Corporation (Bangladesh Pty Ltd), a hundred percent owned subsidiary of London-listed GCM Resources Plc, is proposing the project. GCM is backed by a number of private banks and hedge funds: RAB Capital, UBS AG, Credit Suisse, Barclays Plc etc. Phulbari Solidarity Group exists to support and represent the communities located within the Phulbari region of Bangladesh in opposing the plans for a large open-plan mine in the region. Protestbarrick.net serves as a portal to groups researching and organizing around mining issues, particularly involving Barrick Gold. It contains news articles, testimonies, and backgrounders about Barrick’s operations worldwide. The administrators of this site are volunteers with sincere concerns for communities negatively impacted by Barrick’s operations. Saami Resources is a website about the contested ownership and use of Saami traditional lands and resources. The Saami people are the Indigenous people of Sápmi, Saamiland, covering the northern parts of Norway, Sweden, Finland and the Kola Penninsula of Russia. Saami areas in Sweden are currently experiencing an explosion in mining and windpower development. There has been an increase in both Scandinavian and foreign companies in prospecting, mining and windpower. * To support the community-based movement for positive social change – people collectively tackling challenges which have both a local and global perspective. The US organisation Center for Media and Democracy publishes SourceWatch, a collaborative resource for citizens and journalists looking for documented information about the corporations, industries, and people trying to influence public policy and public opinion. With the help of volunteer editors, SourceWatch focuses on the for-profit corporations, non-profit corporate front groups, PR teams, and so-called “experts” trying to influence public opinion on behalf of global corporations and the government agencies they have captured. Survival International campaigns for the rights of tribal peoples, including peoples threatened by mining projects. Survival has for a long time supported Bushmen in Botswana resisting diamond mining on their land, and it is now also campaigning against Vedanta plc’s activities on tribal land in Orissa, India.